The mission of the PPSP is to develop a comprehensive, institutionally supported program that supports educational and professional development of undergraduate and graduate students interested in Medicine, Dentistry, Veterinary Medicine, and Law. A major programmatic focus is to provide meaningful opportunities that increase student’s exposure to the professions. This is accomplished through strengthening existing relationships with professional and graduate degree granting institutions, supporting professional student organizations, identifying local professionals to serve as mentors and resources, and forming novel relationships with various universities and community partners. 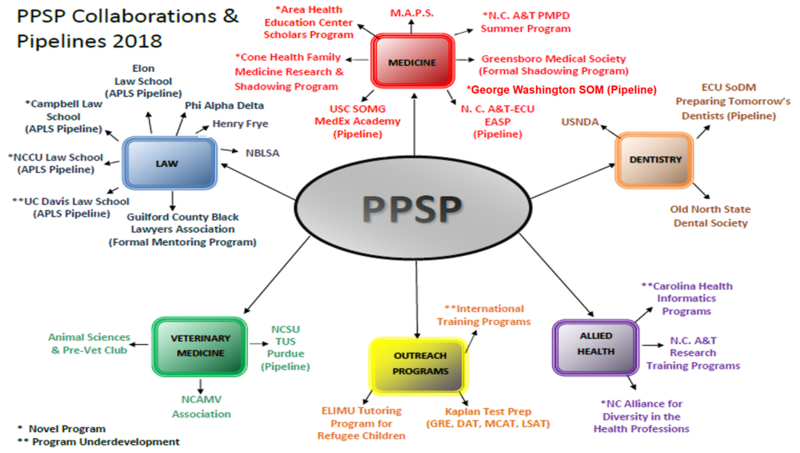 The PPSP was initiated by Chancellor Dr. Harold Martin and former Provost Dr. Alton Thompson in October 2009. An interdisciplinary committee consisting of faculty members form the Departments of Animal Science, Biology, Chemistry, and Political Science and Criminal Justice, was convened and charged with developing a highly structured program to recruit and retain 'academic superstars' interested in Medicine, Dentistry, Veterinary Medicine, and Law.